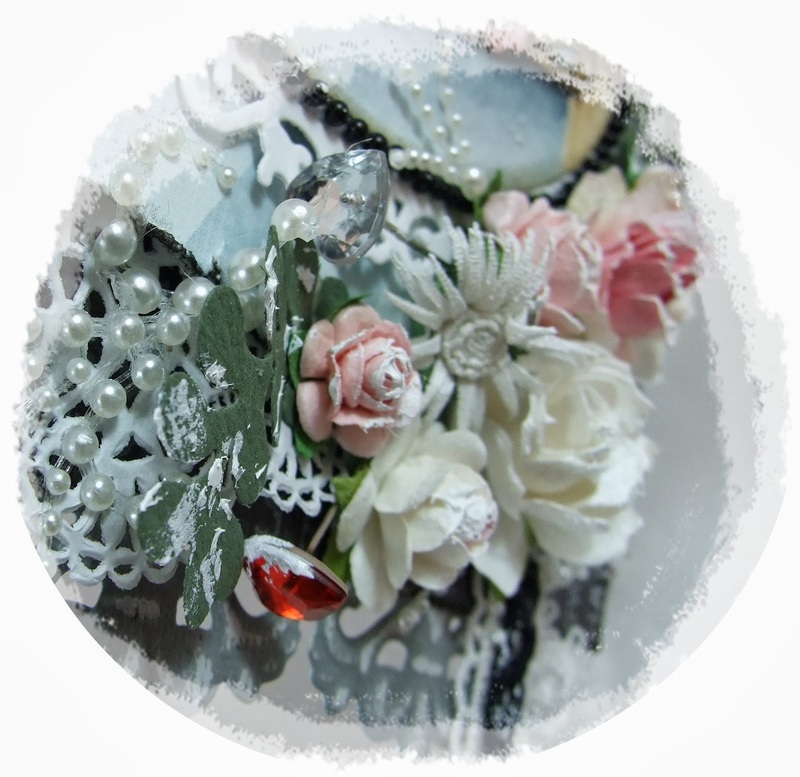 I have used my favourite magnolia doohickey So Wrapped Lovely and added some kaisercraft black lace and a heart charm. 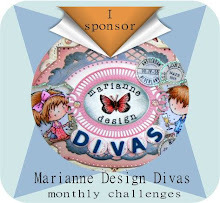 You will also see the new Marianne Design LOVE die, would look fab with a sitting image on too. 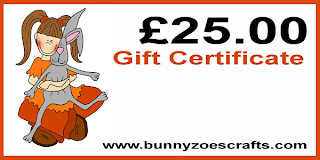 This is due into BunnyZoe any day now, so keep your eye out. 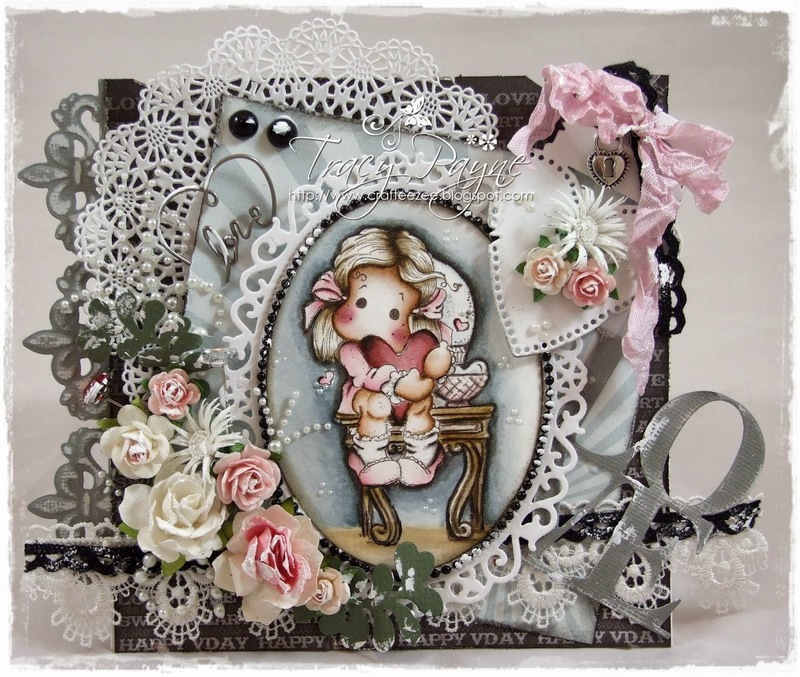 The pink roses and the pearl sprays are also by Marianne Design. I have also added two 8mm black flat backed pearls. I have tried to photograph a close up of the flowers so you can see the heart pins, one in clear and one in red, both available HERE. As usual more pictures and details can be found on my blog HERE. It's Kathy here, with a card I made using a Bildmalarna stamp called Alva Music. This stamp is just beautiful isn't it? I love the gorgeous bird and the way she's looking at it. I coloured them with copics and added a little star dust stickles too. I also used a new stamp from Whimsy called Fairy Tale Dreams and its co-ordinating Crown Die. These are both from new Whimsy designer Simonne Clay and they're wonderful. 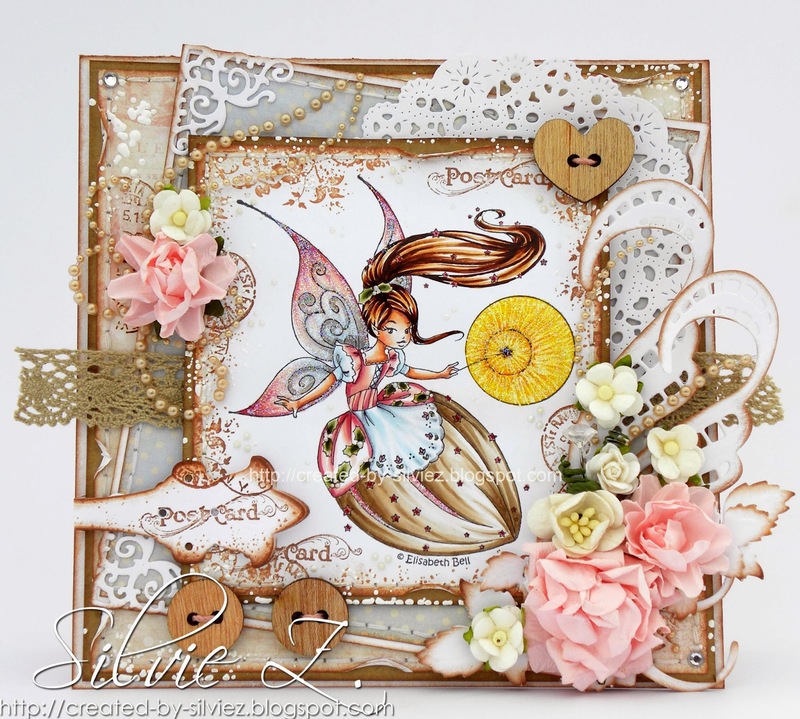 If you like to make cards with fairies or princesses, they're a must have I think. Who knows why I decided to give her purple hair? I was in the mood to do something a bit different I guess because I also decided not to use designer paper. I created my own background instead. I used Dusty Concord distress ink and stamped Lavender Haze and Sheet Music by Kaisercraft onto some grey cardstock. I've also used some white web ribbon and clear gems. 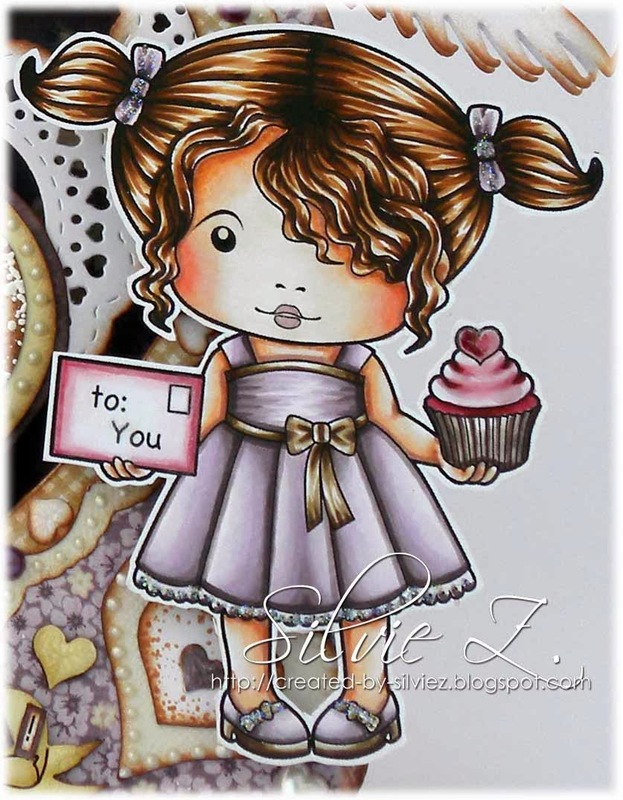 It's Kathy here with a card I made using a brand new Whimsy Stamp called Ciara and Sandy. It's by new Whimsy artist, Sandy Allnock. All of her designs feature pets and her dog is really cute I reckon. 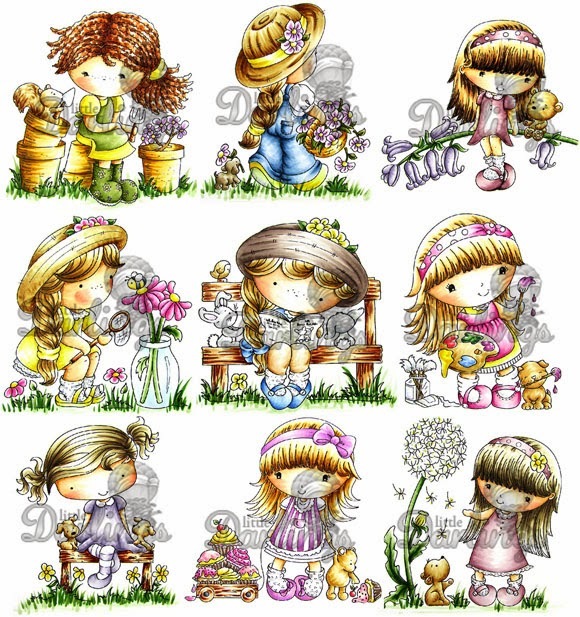 This Whimsy stamp, and lots of others, are available to pre-order now. 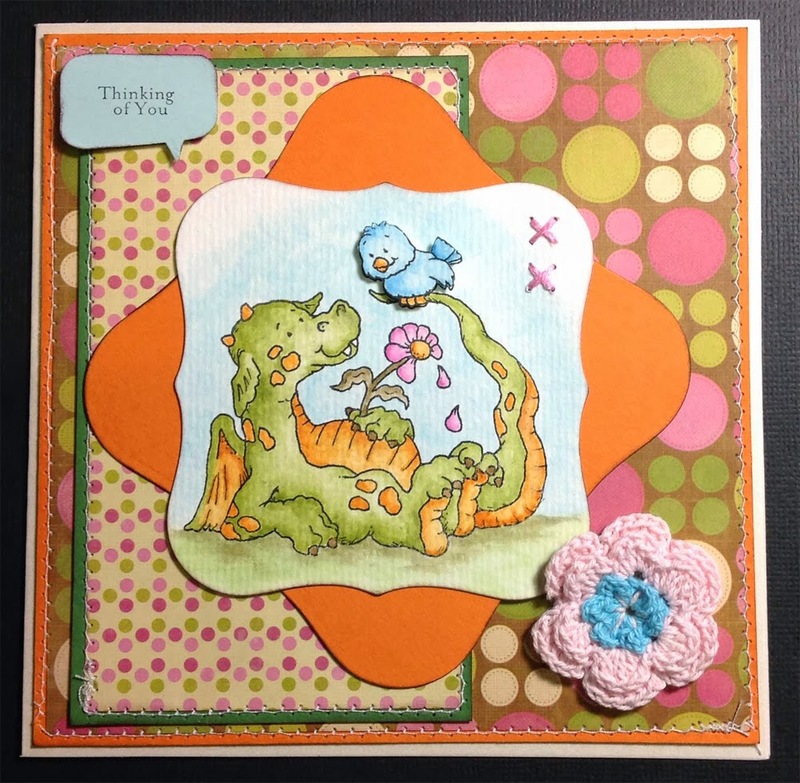 Kathy here, with a card I made using the gorgeous Emily from Whimsy Stamps. You can pre-order her now and you will be so glad you did because she is just so pretty and wonderfully fun to colour too! The sentiment is from another new Whimsy set called Everyday Moments and you can pre-order that now too. 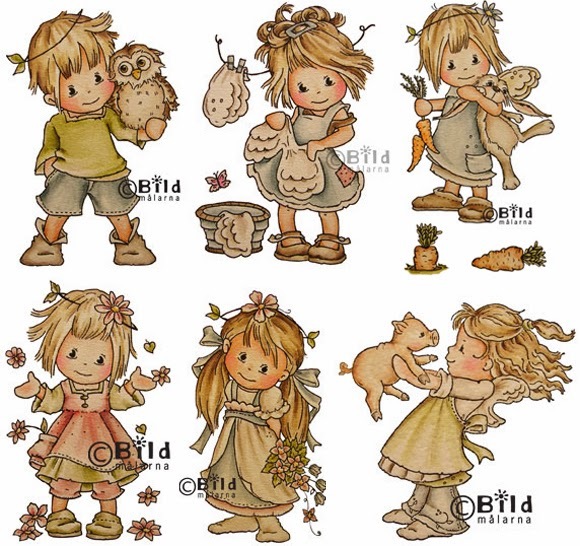 It is a set of sentiments just right for any occasion. 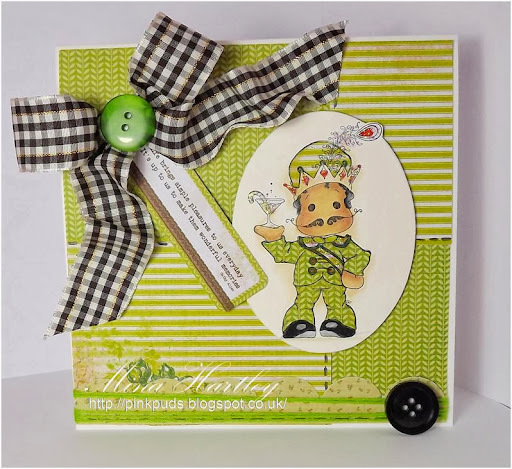 And I have also used the Whimsy Corner dies set on my card. 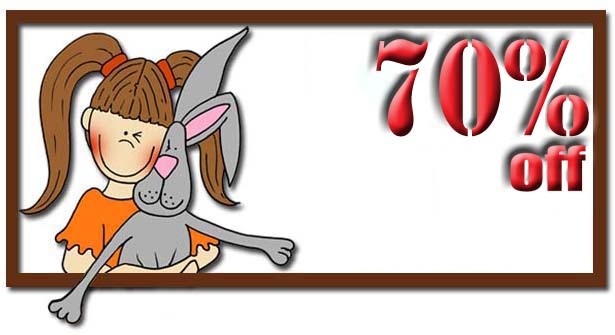 Hi everyone, Becky here again, I know, I'm like the number 7 bus, you wait for ages and then two come along at once. I have been poorly, so not been able to keep my eyes open, let alone anything else, but I am making up for lost time. Here is Eva in all of her glory, this release of Saturated Canary stamps are available for pre order and should be shipping in February. I have coloured her with Distress Markers. Here is a close up of the gorgeous Eva. 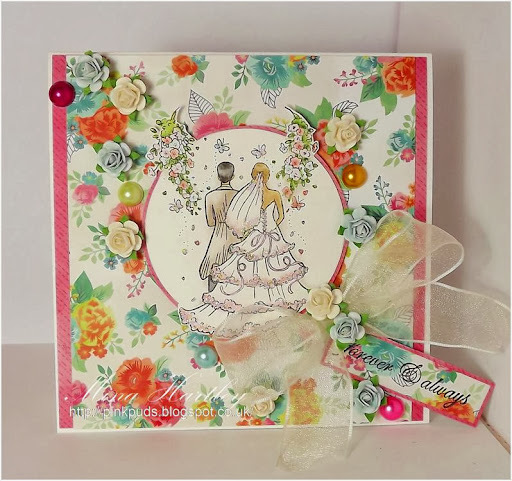 Hi everyone, TGIF, Becky here today with one of my favourite stamps from the most recent Magnolia release, Tilda Hiding Rose Bouquet. She was fun to colour, I love the Tilda's with this curly hairstyle, I have used Distress Markers and Reinkers. Below is a list of products that I have used. Hello and good morning everyone! Today I want to show you a card without a colored image for once. I thought this gorgeous Mannequin die from Marianne Design have to stand for itself. Doesn't each Mannequin want to be in the Spotlight? :o). For my card I used the gorgeous new papers from My Mind's Eye 'Heirloom'. It is already sold out... no wonder... The corners are the Anja's Vintage Corners from Marianne D too. I added some Iridescent Flat Back Pearls - Angel White onto the dress, and some bigger Flat Back Pearls onto the corners. I decorated my card with some Flowers. Wish you a happy day now. Hope you all had a great weekend. For today's card I have used one of the new release Wild Rose Studio images called "Fireworks in Paris". Image is coloured with distress markers. 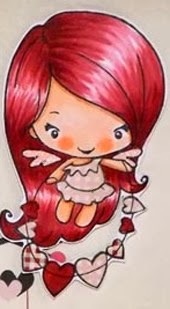 The gorgeous papers are from My Minds Eye's latest release Cupid's Arrow No. 14. 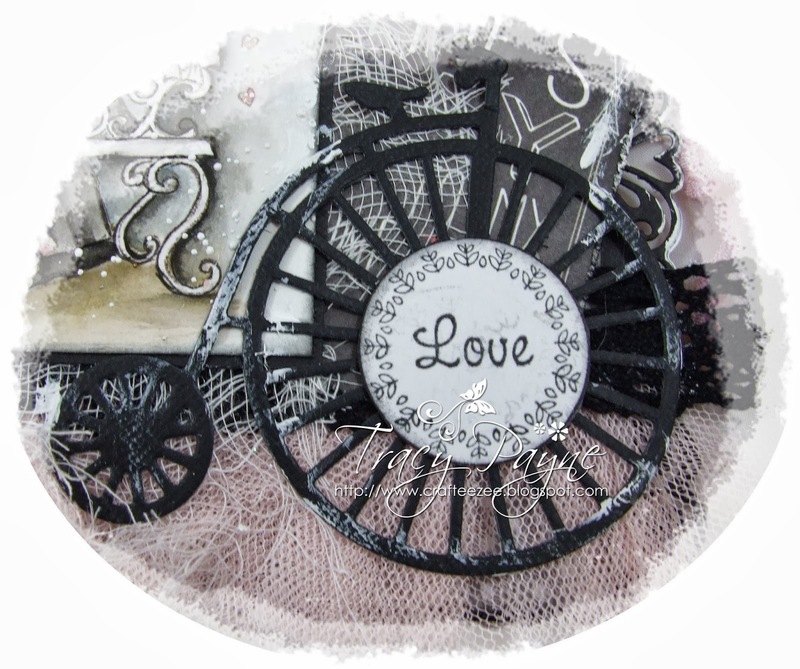 All the edging was created using the Magnolia Edging Sweet Lovely Lace Die. . 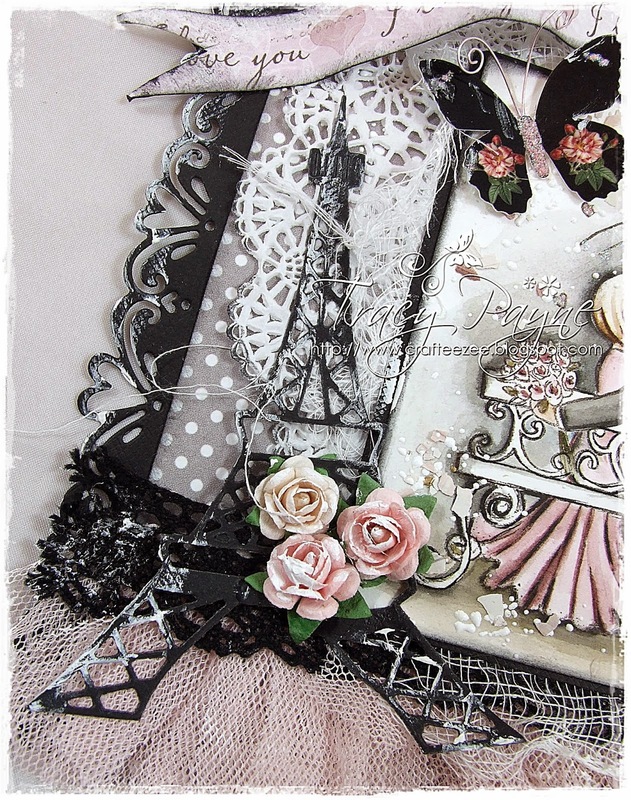 The black lace is from Kaisercraft and the Eiffel Tower is a die from Whimsy, love this die. The gorgeous flowers are by Marianne Design. I have used Magnolia's wrapped so lovely die to make the heart tag and tied some seam binding and a heart charm. 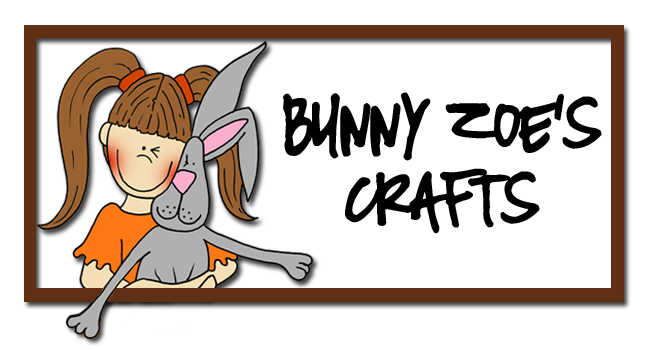 I made this card with a super-cute image from CandiBean called Izzy's Friends. The paper pad is Summer Stories by Teresa Collins, and it's really gorgeous, I love the soft colours in it! 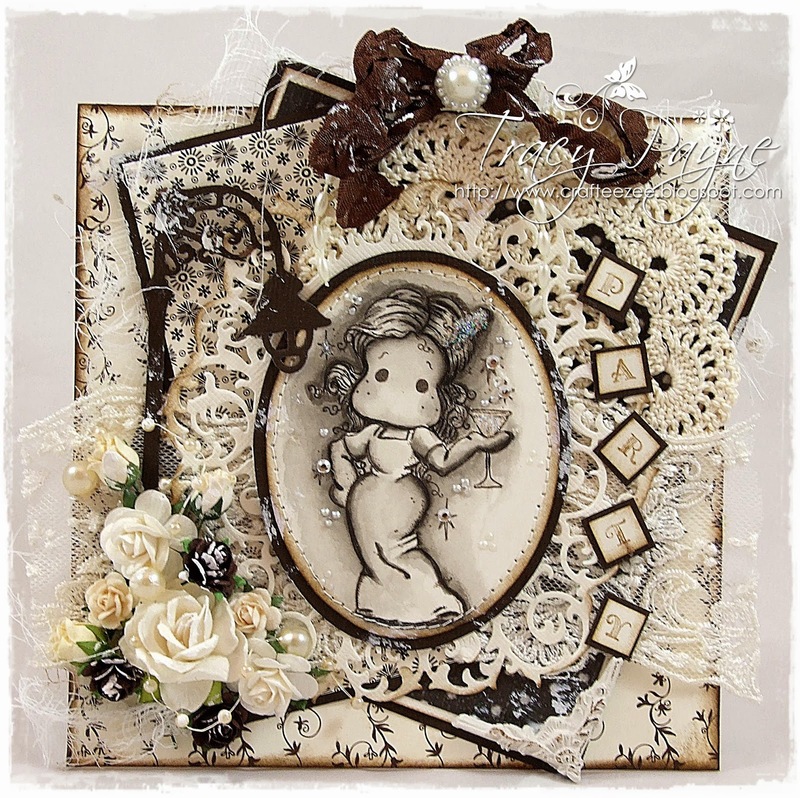 I've used the Tattered Florals die by Tim Holtz and the Faux Crochet border die by MFT. I've also used some black flat backed pearls , a Prima Tea Thyme button and some antique linen and walnut stain distress inks. ive used Marianne Oval Frame die which i cut and embossed then cut in half to pop under the image i love this die its perfect for smaller images or sentiments but chop it in half and it can fit a larger image perfect !! 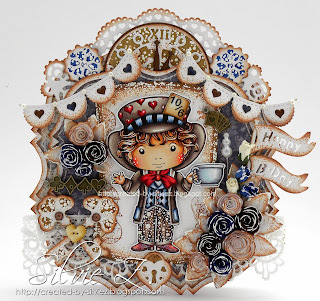 I'd like to share another make with the brand new La-La Land Crafts CHA release items. This time I colored HEART CUPCAKE MARCI. She's gorgeous, I just love her hair!! The wings are by La-La Land Crafts as well but they are not currently in stock. If you drop Nikki an email, she might get the set for you if you're interested. 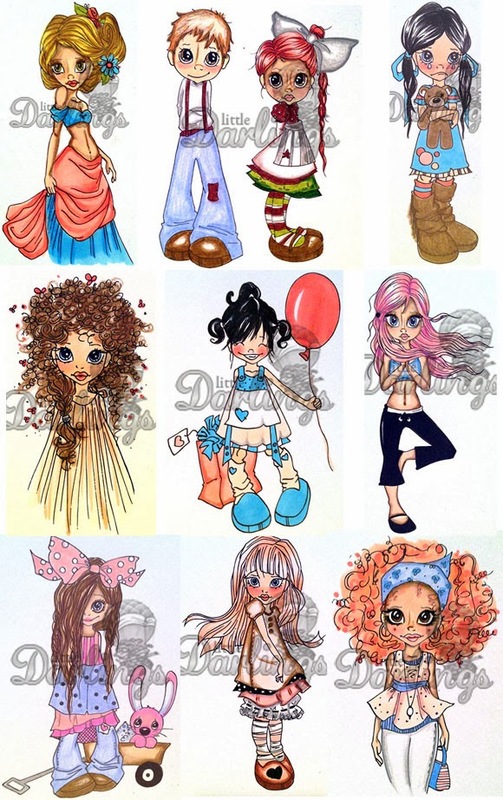 Image is colored with Copics. 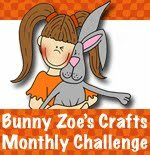 The flatback pearls are from Bunny Zoe's Crafts as well. I'm here to share a card with the brand new La-La Land Crafts stamp and dies. 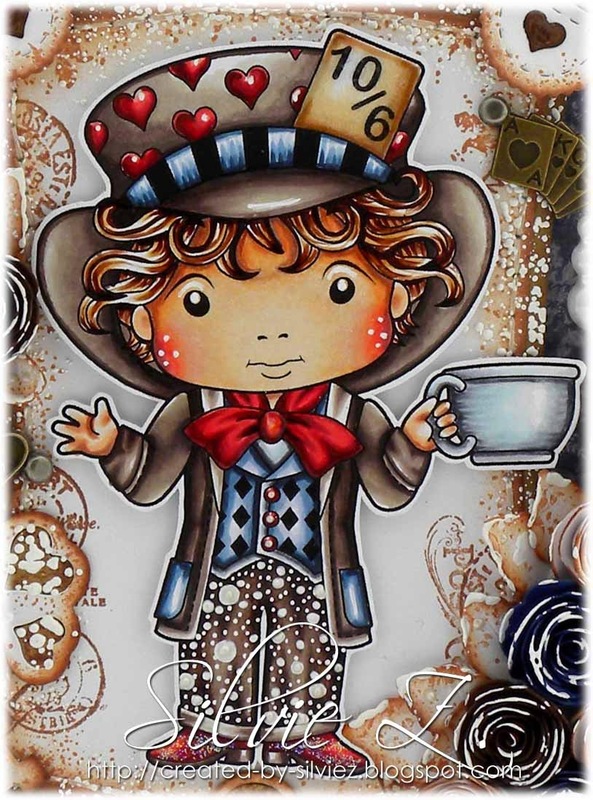 The image on my card is MAD HATTER LUKA. He's a cutie, isn't he? 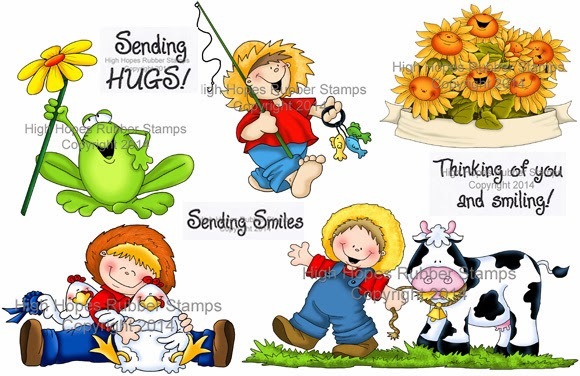 The Greeting Farm *NEW* StampsNOW SHIPPING!